Rather a lot to hack through this week so let us get started. Polish club to celebrate 25 years of the Wandering Dragons. Only Dragons or ex-Dragons were allowed to play. It was scheduled for 6 rounds - I paid for six rounds. We played 5 rounds (it's a Dragons thing, best not to ask). 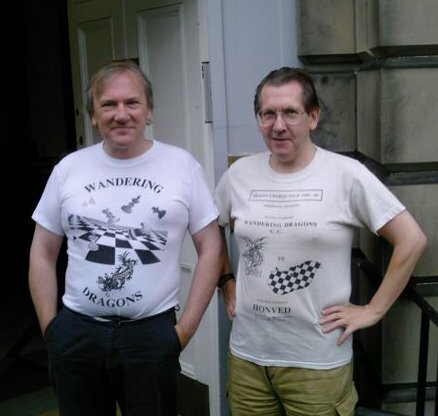 Graham Paterson and Jannic displaying their Dragons t-shirts. Here is a shot that will brought back some memories. Chris Dunkin (white) playing Howard Nimmo. I'm sure you will get all tournament info there. 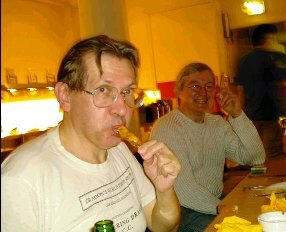 After the event everyone retreated to a Chinese Restaurant. Jannic and Bill Falconer look happy...why? ...Because neither of them is paying the bill. So who was stuck with the tab? I cannot explain the next picture. from one of his sweat shops. so you will get one of mine. Chandler v Sanderson. I've sacced my Queenside for tricks and traps. 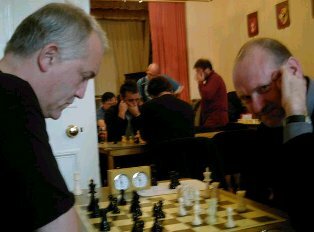 double attack on h6 and the a7 Rook. about unprotected pieces... Am I talking to myself here? Unprotected pieces are the root of double attack combinations. Double attacks combo's are the easiest to spot and play. Stop leaving your pieces unprotected and you will stop losing. I really am getting fed up saying this! 11 days after the above game was played. C. Willman v G. Chandler. My move and I have set up a nice little perpetual. 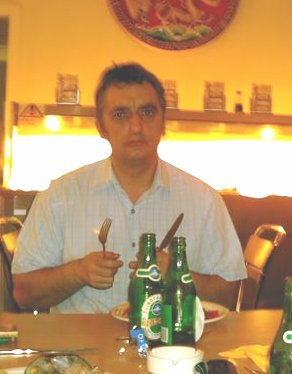 26...Nxd3 27 Qxd8+ Kg7 28 cxd3 Qd1+ - Qg4+. etc. Suddenly I decide I can win this and play 26...Rd7?? See that Knight on c5...it's unprotected. 27 Qe8+ Kg7 28 Qe6+ a Double attack on King and Knight 1-0.
example of what can happen if we leave our pieces unprotected. miss the fact I had given the Queen e8 as a checking square. Do you want hear something funny? This game was played on board 2 in the Bells 1 v Dragons 1. League match. I looked at boards 1 & 3 to see how they were getting on. My opponent will back me up on this. when I had achieved the perpetual and started looking around. Board 1 Ruxton (Bells 1) v Orr. Endgame, Orr has the Bishop v Knight. My assessment: loss for Keith, possible draw. Board 3 Rattray (Bells 1) v W Burnett. Middle game. Mickey has an attack but Black looks solid. Possible loss there. "We are in trouble - I had better play for the win." I resigned a move later. Down in the bar 5 minutes pass and Mark Orr arrives. Another 5 minutes pass and Mickey Rattray appears. as I was looking at it. How naff a chess player am I? My assessment of a draw and a loss were infact two wins. look at other people's game when I'm playing. They always appear as a jumble of randomly placed pieces. Here is the Mickey Rattray game. the white squares f5, e6 and d7. After 22...Bxh5? White is winning. Mickey wraps it up well. I pulled a game off the Scottish Bulletin board. It was played by The Moderator of the site, Dave Gillespie. I played over the game. It's a Caro Khan and ends in a draw. So I'll save it up for another day (I bet you cannot wait). I know but I could never figure out who. Then I picked up a 'Rumpole of the Bailey' book. I love Rumpole "...her who must be obeyed..."
It had a cartoon on the cover. What next? Oh Yes Gavin Austin. I've been mailed, is Gavin Austin related to Rudolf Austin? Here is Gavin's latest game. In this position White to play. Gavin is Black and he is about to go two pieces up. I'm afraid to report that Gavin lost. Here is the game. Look out for White's 8th move. A good practical choice. Incredibly, after all the excitement,the material is level. I have the score but the moves went all bad after 15 Qxe4. Black obviously got very depressed and stop recording correctly. Chess career will no doubt agree he is improving. a pleasant memory from 1983. Boy I was good player then. with above position? I'm White, me to play. (Note I cannot sac on f7 - I've already done that). The sac on f7 was deliberate, 8 0-0 was a blunder. looked at this position he was a picture of shock and horror. later on I sac another piece. So I'm three pieces down - I sac my Queen. (although to be honest, at the time I do have two). and I win - look and learn, play it out and weep. I quite enjoy your site, funny and instructive. I thought you could use this quote. pedagogically inclined player who is much weaker. – Michael de la Maza. unless they have changed their email address. I think you are trying to say I'm a pedagogically inclined player. I've no idea what pedagogically means. Does it mean I have a limp? I find the quote silly - too many probably's. Mr Maza is probably some place, probably sitting on a fence. I have posted a review for this book on the site that got me the book. It would be unfair for me to fully review it here. So here I will do it my way. First of all. Do you know how I keep myself in line. I have circle of friends whose opinion I trust. I frequently ask them if they think this site is OK. I listen to their ideas and comments. If something is naff. They tell me. I thought Jonathan's 7 Deadly Chess Sins was an awful chess book. Too much arty-farty confusing clap-trap and waffle. (I'm the chess expert on waffle). I'm not alone in my opinion of 7 Deadly Chess Sins. Most people I have discussed this book with agree it's long winded. That was from one of Scotland's leading players just a few days ago. Studying a good chess book can help you improve your game. The more you study the better you get. 99% of us don't study the game. into your head. That is being a parrot. if you missed any combo's - that is being a fool. I did for about two or three years. and a small amount of natural ability to spot a combination. Some Chess players have a better start than others because of natural gifts. If these gifts are nurtured and honed correctly. Wallah, a good player. Natural ability is not the private property of chess. kick a ball better than others. There are winners, there are losers. Bobby Fischer, I'd say is the greatest player of the game that ever lived. He was once asked how he became a Grandmaster. His reply. "One day I got good." He got good by studying, studying and then studying some more. He lived and breathed the game. Ideally you need a good teacher to guide you. If not, then a good book. In my opinion (and I stress my opinion, what worked for me). The book(s) has to have instructive well annotated games. Good advice about how to develop your game further. How to erase any sloppy errors that have crept into your game. All wrapped up in PLAIN EASILY UNDERSTOOD ENGLISH. Add a dash of humour to make the work fun and that's it. accounts except for the game notes. we should add two more: writing this book, and buying it.."
Jonathan too has friends. Honest friends. Someone has told him Deadly Sins was too high brow. Well that is my explanation as to why the complete change in writing style. 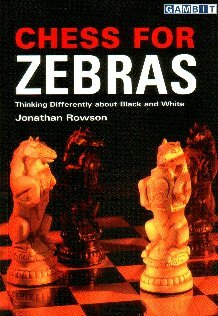 Chess for Zebras matches every criteria for a good book. and it actually crosses the barrier. It is an excellent chess book. It is one of the best chess books I have ever read. It has very nearly got me into study mode again. Do not please do not pre judge Zebras because of the Deadly Sins. I know some people already have. Do you know who is going the best benefit from this book? find themselves stuck on a grade and cannot get higher. Read the book, smell the coffee. Read the book and wake up. Wait a minute... I've got a great idea. Zebras even more than Deadly Sins. Jonathan then will have to write an even better book! Nah... He's not going to top this. It's unique. the guitar popping up during this book review? You will have to buy the Book. I put Chess + Zebras into Google. I was taken to a fairy chess site. As is if chess was not hard enough. Look at this. tend, in general, to make play unduly difficult. my mates will giving me a row.